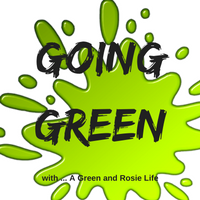 A Green and Rosie Life: Naked or Plastic-wrapped - Which is the Better Swede? 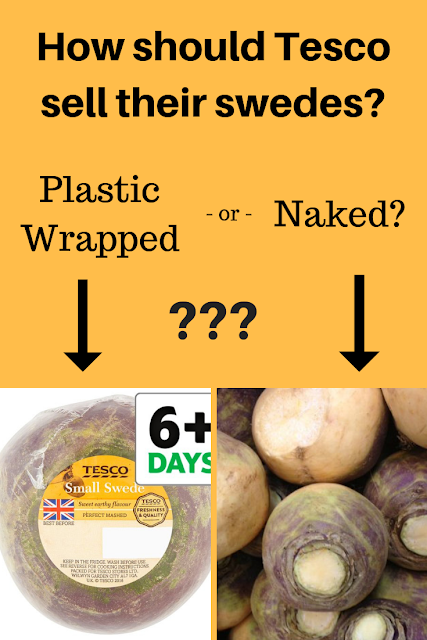 Naked or Plastic-wrapped - Which is the Better Swede? In my previous post I wrote about the importance of contacting supermarkets (and other businesses) by social media if you refuse to buy something they stock on environmental grounds. 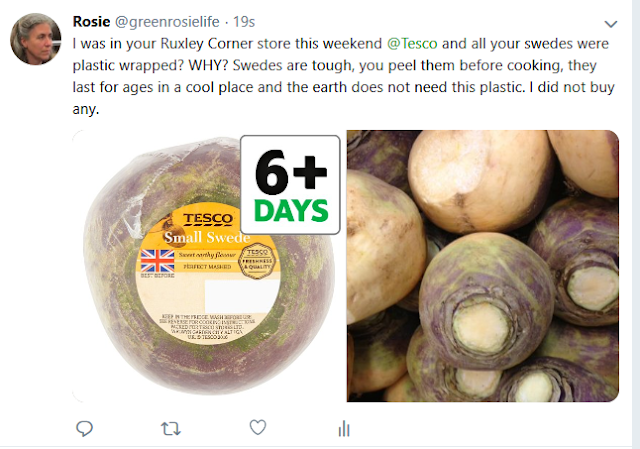 True to my word I tweeted to Tesco about the plastic wrapped swedes I saw in their Ruxley Corner store at the weekend. And this is how the conversation proceeded. Hi Rosie, thanks for your patience. The plastic wrapper on swede helps to reduce dehydration and therefore helps us to reduce food waste by extending the shelf life. By removing the plastic we believe that the resulting waste of resources in growing, packing and delivering swede to stores would outweigh the energy and resource saved by stopping our use of the plastic wrapper. You can also recycle the plastic wrapper at front of our larger stores, with plastic carrier bags and we are working on ways to communicate this better on pack. Thanks, Jess. Thank you for responding Jess but I hope you will not be offended when I say that your response is totally unsatisfactory. Swedes are a hardy winter vegetable that, when stored correctly, will last for months without spoiling. I appreciate that your customers probably won't want to store them as gardeners and farmers have for centuries in damp sand in a cool, dark shed but swedes can just as easily be stored at home for several weeks without any risk of dehydration - simply pop them in the veg drawer of the fridge or store in a shed or garage. In today's world most people shop once a week and in this way swedes will be absolutely fine and will show no signs of dehydration for 7 days. In fact I have one I bought well over 2 weeks ago and it is still perfect. You say that by removing the plastic there will be more losses in growing, packing and delivering swedes. How? Swedes grow without plastic, have a tough skin to protect them from field to supermarket and are not a vegetable that suffers from bruising. How does adding a manufacturing process (ie the plastic wrapping) reduce costs? This may be a factor with some fresh produce that is easily bruised or otherwise damaged in the process of getting it from farm to consumer but not a swede. Also if this was the case I would expect Tesco swedes to be cheaper than in other supermarkets which supply unwrapped swedes where-as actually your prices are comparable to many other supermarkets and significantly more that Asda or Lidl. So I simply cannot see how this is true and would be interested to see figures to support this. Recycling is often what supermarkets fall back on when questioned about their use of plastics. The truth is recycling is not the answer. Plastic causes huge a amount of pollution in its initial production and also when it it taken to be recycled. But in fact most plastic is not recycled but DOWNcycled into a other form of plastic that itself cannot then be recycled. It is not a closed loop in the same way that glass or aluminium are. All plastic remains as plastic forever and most of it ends up either in landfill or polluting the countryside or oceans. You say you are working to communicate better that the plastic wrapper can be recycled - might I suggest it would be better for the environment if you were to remove all this unnecessary plastic packaging and communicate to your customers how to properly store fresh, unwrapped swedes (and other fresh produce). Oh and there is absolutely nothing wrong with a slightly dehydrated swede - after all it is going to go soft when you cook it and is not eaten raw where being super crunchy might otherwise be best. The attitude of Tesco in continuing to add unnecessary plastic packaging to fresh produce is appalling, especially at a time when more and more people are aware of the damage plastic does and wish reduce how much they are forces to buy. Even if you are able to show that wrapping swedes in plastic extends their shelf life or reduces losses, the negative impact of the plastic on our planet will outweigh any minor gains. Plastic is completely unsustainable and supermarkets such as Tesco need to be working to reduce how much they produce not offering lame excuses about extended shelf life and cost saving. To date they have not replied further to me. So what do you think? Should Tesco be selling swedes wrapped in plastic? Please do let them know if you think NO. If you wish to retweet my original tweet or contact Tesco yourself regarding plastic wrap swedes here's a link to the tweet. Feel free to use the pictures - one is from the Tesco website and the other a free stock image. Good to know that the bag recycling includes plastic wraps. We put ours in, but didn't know if that was right. Yes, while cucumbers go limp unwrapped, as do many other veg, I can see how swede might be a top contender for 'plastic free'. Most veg will stay fresh and not limp in the fridge for a good number of days. However if you want to keep a cucumber crisp for more time pop it in a glass of water (uncut end down) - it'll stay crisp even longer like that. Also, any produce plastic wrapped with some damp mud or moisture on them risks going mouldy much quicker when sealed in plastic. Such a great response Rosie. I'm not surprised they haven't replied to you, as they'll have no answer that will be satisfactory. I hope that it has forced them to think more clearly about this issue and get educated about it. Keep up the great work!